Omega Plus® was launched in the new packaging in early August by Omega Innovations, a division of the iconic Marlborough Sounds-based company, New Zealand King Salmon. 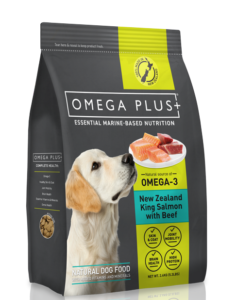 Made predominately from omega-3 rich New Zealand King Salmon – Omega Plus® provides pets with tasty high protein nutrition that supports their joint, brain and heart health and gives them a shiny coat. The Omega Plus® box pouches feature a precision gloss over lacquer that emphasises the fresh ingredients by making a photo of fresh salmon stand on the pack print. Being able to source high quality New Zealand made box pouches was mission critical for Omega Innovations. Simon and his sales manager, Tina, visited the Convex plant during the printing sign off process and were impressed with the way the printing staff went out of their way to ensure every specification was met. 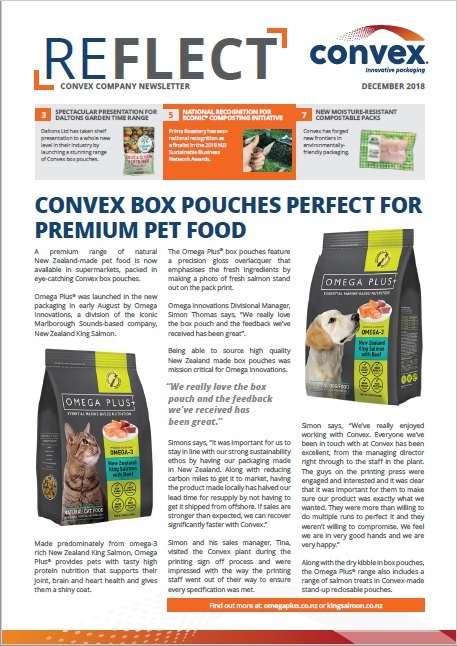 Along with the dry kibble in box pouches, the Omega Plus® range also includes a range of salmon treats in Convex-made stand-up reclosable pouches.